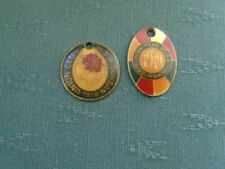 Butlins Beaver Club Badges x4 1970s. Condition is Used. Dispatched with Royal Mail 2nd Class Large Letter. # Excellent condition, height approx 4cm. RARE!! Blue Peter vintage badge. Condition is Used. Dispatched with Royal Mail 2nd Class Large Letter. UK Scout Proficiency Badge early 1970's, Meteorologist. Condition is New. Dispatched with Royal Mail 2nd Class Letter. A good badge for any collection. The pictures show enough hopefully - pin and fixing in place. UK Scout Proficiency Badge early 1970's, Boatswain. Condition is New. Dispatched with Royal Mail 2nd Class Letter. UK Scout Proficiency Badge early 1970's, World Friendship. Condition is New. Dispatched with Royal Mail 2nd Class Letter. UK Scout Proficiency Badge early 1970's, Forester. Condition is New. Dispatched with Royal Mail 2nd Class Letter. 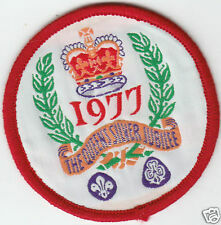 UK Scout Proficiency Badge early 1970's, Observer. Condition is New. Dispatched with Royal Mail 2nd Class Letter. 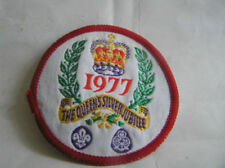 Boy Scout Girl Guide Badge 1977 THE QUEEN'S SILVER JUBILEE (w44). Condition is Used. Dispatched with Royal Mail 1st Class Large Letter. 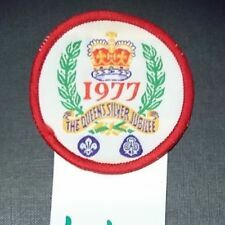 UK Scout Proficiency Badge early 1970's, Sportsman. Condition is New. Dispatched with Royal Mail 2nd Class Letter. The picture shows enough hopefully - pin & fixing are both in place. A good item for any collection. 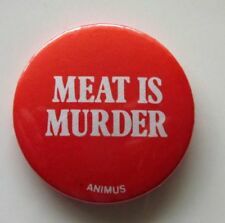 A good badge for any collection. Good badge for any collection. The picture shows enough hopefully - pin & fixing in place on the back. 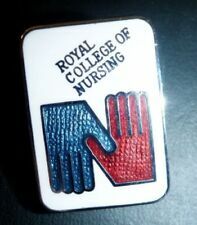 Good badge for any collection. An excellent example of a 1970s Camping Club of Great Britain & Ireland enamel brooch lapel badge finished in enamel and gilt. Badge measures 24mm diameter with rear clasp and pin for attachment. A nice piece in excellent condition - Would make a great addition to any collection. The Queens Diamond Jubilee. Girl Guide Badge. Authentic 1970s Badge Punk - Anti Nazi Leaque - Stop The NF Nazis. Condition is Used. Dispatched with Royal Mail 2nd Class. A good badge for any collection. The pictures show enough hopefully - both pin & fixing are in place. The pictures show enough hopefully - both pin & fixing are in place. A good item for any collection. Vintage Clacton-on-Sea Bowling Club Badge.c1960/70s. A great slice of UK nostalgia here. A google search does not give much info on this either. Has been in storage for 40 years now and hope it will go to a collector who will cherish them more. Scout Badge 2002 - 2008. Joining in Award 9 years. Light wear See pictures. drawer 2 pod 10. ERMA - GERMANY. VERY GOOD. PP FREE UK ONLY. Beaver Scout Badge - Pre 2002. Scout Badge 2002 - 2008. Joining in Award 1 year. A good badge for any collection. The pictures show enough hopefully - pin & fixing are in place. A good badge for any collection. The pictures show enough hopefully - good condition - pin and fixing in place. DOM - FURNITURE FACTORY. EXCELLENT CONDITION. PP FREE UK ONLY. Just William Fan Club - Badge. The size of the badge is 1" or 25mm.